Pioneer’s A-400 integrated amplifier came out in the spring of 1990, to a rapturous reception in the UK. Part of the dynamic was the fact that Japanese amplifiers had – until then – been regarded with great suspicion in the British press, simply by virtue of the fact that they weren’t particularly audiophile in orientation. For example, the Pioneer SA7800 of a decade before was more of a mainstream product, bedecked in fripperies, garish fluorescent power meters and tone controls cutting in at various points. The A-400 however was not like this – it was a far more focused product that zoomed right in on British audiophile integrated amplifiers. To this end it had no tone controls – radical stuff for Japanese designs of the early nineteen nineties! Nor did it have any other facilities to speak of, aside from independent source and record switching. It was gunning for the Brit-pack of Naim Nait 2, Mission Cyrus 2 and its ilk, but offered sturdy Japanese build that the British designs struggled to match at the price. By comparison, some seemed a little too ‘cottage industry’. It was this combination of British audiophile minimalism – for which the folk at Pioneer GB had lobbied so hard – and Japanese quality that made the A-400 special. For the first time, Pioneer’s Tokyo factory set up a production line for this bespoke British market product. It charmed the British hi-fi press, causing What Hi-Fi to wax lyrical and hand out an award, and Hi-Fi Choice championed its cause too. Stories abounded of it bettering £1,000-plus pre-power amplifier combinations. The little A-400, selling for £240, went on to sell nearly 30,000 units in the space of a couple of years – which was a lot! 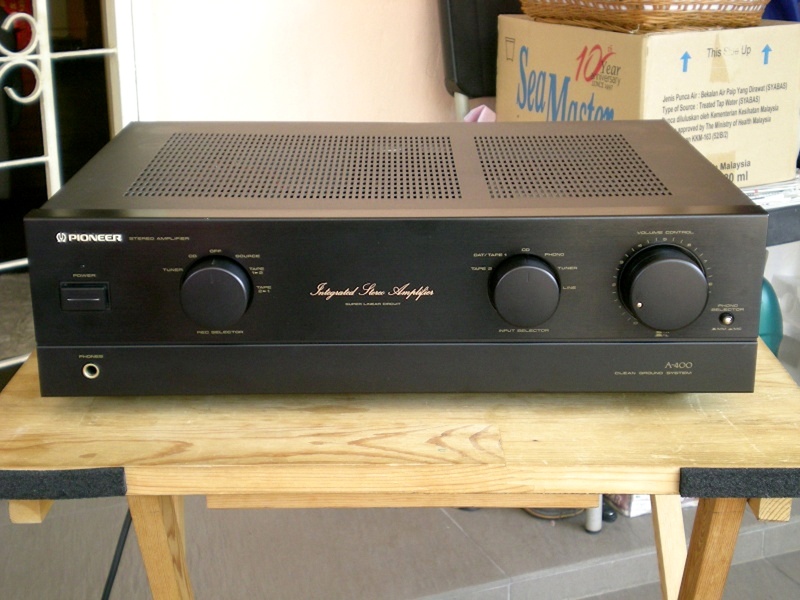 In value terms, it won Pioneer nearly 13% of the entire British amplifier market. It was followed by the A-400X, which stayed in production until 1996. Putting out 50W RMS per channel, it was a powerful thing. It doesn’t seem so much now but it went loud compared to many British rivals of the day, and was just about able to drive most loudspeakers – something you couldn’t say about many of its competitors. Being an early nineties amplifier, the wee Pioneer came with a MM/MC phono stage (offering 2.5mV/ 50 kOhms and 0.2mV/ 100 kOhms respectively), but it wasn’t an especially good one – being based around a relatively inexpensive op-amp. Via line it was a capable enough performer, it not quite as good as many of its rave reviews suggested. The original A-400 had a powerful, punchy and muscular sound by the standards of its time, and was decently rhythmic to boot. However, it wasn’t strong at soundstaging and didn’t have the finesse or the naturalness of rivals such as the Musical Fidelity A1. It was the sort of amplifier you bought for a difficult-to-drive pair of standmounting speakers, when nothing else at its price was quite man enought to aspirate them. The A-400X that followed was an altogether softer sounding device; despite being claimed to be ‘improved’ it simply seemed to take some of the meat out of the sandwich, so to speak. It did offer a slightly more three dimensional soundstage and a sweeter upper midband, but lost some of the life of the original – which itself wasn’t exceptional in this respect. Looks wise, the A-400 has aged badly; it was never that attractive when new but like a typical Japanese car, it hasn’t got any prettier with age. Although assembled well and finished slickly, this 8kg amp was never the most exotic looking and its slightly narrower than standard width case (420x352x126mm) wasn’t as lovely as many British rivals; it seemed rather plasticky by comparison. The Pioneer A-400 is a good amplifier, but its problem is that it isn’t a great one – despite having been hyped up as such. Still, if you can find a mint example for under £100, it should serve you well for a very long time.